It's no secret that chocolate is a guilty pleasure for many. Appeal to a wide audience when you add your brand name to everyone's favorite treat with help from ePromos! We have dozens of options for confections currently awaiting your custom logo. Gift out chocolates as a present to customers, or offer them as an incentive at big events and trade shows. Give your marketing campaign a little something sweet with promotional chocolate gifts that are sure to appeal the palate, along with your bottom line! Custom Chocolate Coins w/ Foil Wrapper - 1.5" dia. 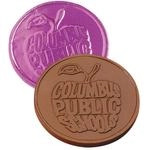 These treasured custom chocolate coins will richly reward any promotion. Custom Chocolate Bar w/ Full Color Wrapper - 1.75 oz. Delicious custom chocolate wrappers with your company logo in full color imprinted wrapper and molded with a custom or stock logo. Custom Chocolate Star - 1 oz. This custom chocolate star is a sweet way to reward the rising star in any event. A promotional chocolate cigar is a sweet way to celebrate any occasion or promotion. Your recipients will enjoy a steaming cup of delicious custom hot chocolate on chilly days to warm them up at home or in the office. Iconic promotional chocolate by Hershey ® Kisses now with your logo featured on the bottom of each of these delicious Kisses! Kraft Custom Pillow Box - Cocoa Dusted Truffles 3.5 oz. Add a touch of elegance to your next giveaway with this Kraft Custom Pillow Box filled with Cocoa Dusted Truffles! Your design is foil stamped in black on the front of the box, ensuring maximum brand visibility. Kraft Custom Pillow Box - Dark Chocolate Sea Salt Cashews 5 oz. Recipients will want to get their hands on this Kraft Custom Pillow Box filled with Dark Chocolate Sea Salt Cashews! Your design is foil stamped in black on the front of the box, ensuring maximum brand visibility. Kraft Custom Pillow Box - Chocolate Covered Almonds 5 oz. Filled with Chocolate Covered Almonds, this Kraft Pillow Custom Box makes a special treat for employees and clients! Your design is foil stamped in black on the front of the box, ensuring maximum brand visibility. Give your clients the warming comfort of this Full Color Hot Chocolate On A Spoon Custom Kit! Choose from milk or dark chocolate, and get creative with toppings like marshmallows and crushed peppermint. Wrap your logo around these decadent chocolate custom candy treats filled with chocolate chip cookie dough. Assorted gourmet custom candy in a treasure chest gift box with your logo makes a great gift any time of the year! These promotional chocolates are a lavishly rich way to show your appreciation and promote your company logo. Custom Shape Chocolate Bars - 1 oz. Custom shape chocolate bars are a smooth way to spread you message. Order these Full Color Mini Custom Candy Tins that are filled with Chocolate Littles or Colored Candy to hand out at your upcoming tradeshow or event. Your imprint is printed on a high gloss laminated four color process label! Individually Wrapped Custom Candy - English Butter Toffee - 2 pcs. Wrap your logo around these decadent chocolate custom candy treats filled with english butter toffee. Wrap your logo around these decadent chocolate custom candy treats filled with caramel. Custom Chocolate Lover's gift tower for the perfecr year-end gift. A Custom Chocolate apple rolled in walnuts with imprinted sticker is perfect for any giveaway! 8 Piece Promotional Chocolate w/ Chocolate Bar Centerpiece - 6 oz. Promotional chocolate is a universal gesture of Thanks and it makes for a sweet and tasty logo as well.